The most consecutive hours my husband and I get to spend together are about 5 hours, 1 day a week. I talked about this recently actually. I was one of the featured moms to contribute to a mommy’s Instagram loop called “Mommy Connections”. It was started by Amy (@Aperfectlymessylife) and it is a just fun a way for moms on Instagram to network, ask/answer questions and share experiences. If interested in checking out #MommyConnections…click this logo. @aperfectlymessylife's Instagram Loop goes live on Monday evenings. Things that help us hold it together. 1. Communicate throughout the day. 2. Try not vent via text or email. So let’s expound on each idea. It's 2015. Almost every phone service provider is offering something that is unlimited. It’s either minutes or texts…if you have the extra dough, bump up your data plan. Neither of us can use our cell phones while working but we both try to make the most of our breaks. Communicating throughout the day helping keep us connected although majority of the time, we're apart. When we’re not communicating well, it never fails someone is left with a kid and no stroller. (Trust me, it’s happened more than once to both of us) Keep each other updated! Oh and social media counts too! Remember that everyone has bad days. Everyone has something that causes stress. Try not vent via text or email. Your tone could be easily misunderstood and this could cause assumptions and miscommunication. Although your mate is there for you, maybe try to calm down first before reaching out. You’d never want misplaced stress or anger from outside of your relationship carrying over to your mate. Sometimes knee-jerk reactions just can’t be avoided…but try to work it. Google makes this super easy for us. Being on the go and one of us always having the little one means it isn’t easy to just pick up and go. So we tend to share our calendar so each party is aware of outside of work events. If you work shift varies weekly, post it weekly on the fridge, so that your mate is always "in the know" and not left wondering if you're working, having car trouble or worse. Bow-chicka-wow-wow! Sometimes we just have to make the best of the time that we do have. (hubba hubba) Not having time together every weekday after the kids go to bed means you have to be creative to see each other. This can keep things fun and exciting (if you let it). Intimacy with your partner is essential to marriage. Share with your spouse what intimacy means to you. Try to compromise so that everyone is getting emotionally and physically fulfilled. Oh, and have fun! There is nothing worse than feeling like you didn’t accomplish anything all day. I’ve been there and my husband has been there. Finding time for errands and domestic duties all while working full time can be tiresome but those things just have to get done. Schedule certain days to do certain things. Like Friday night is laundry night or Tuesday is grocery day. You’ll truly burn yourself out trying to do everything on your one day off. Also communicate with your spouse when you need help. What were all those vows for again? Help me! Don’t let pride get in your way. 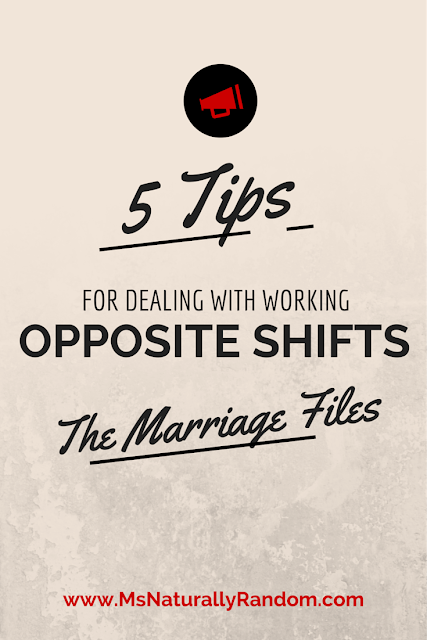 Those are my five top tips to deal with working opposite shifts. In homes where both parents work, children always need to be bathed, dressed, picked up from daycare/school, and fed...etc etc. That means both parents (when home) have to chip in. Let's not fall into the habit of assuming your partner took care of it. So communicate, slow to anger, plan together, make time for making whoopie and use time wisely! How do you balance family time vs. work time?